When I first started messing around with custom taxonomies, along with custom post types, displaying the terms like I would the default categories or tags really tripped me up. In this short tutorial my aim is to make it easy for anyone wanting to display custom taxonomy terms. Once you start getting into custom post types, taxonomies and all the rest, it can be quite confusing to know the difference between a taxonomy and a term. Taxonomy: This is the collective name of all the terms together. It’s like saying “categories” or “tags”. Terms: These are the individual categories or tags themselves. For example, “Personal Thoughts” or “Lifestyle”. The reason the $display variable is set to false is to make the default an echo, not a return. The reason the code below allows you to echo and return, is so you can use the function in an if-else statement. 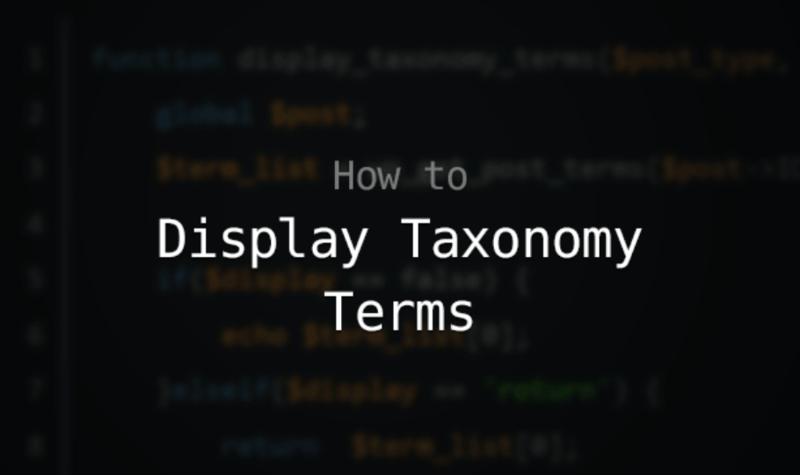 The first thing to do is go into your functions.php file and create a new function called display_taxonomy_terms. Then add in the two variables we’ll be passing through. You then need to call the $post variable, which is built-in to WordPress and contains information from the current loop. Now you need to get the terms that are attached to the current post in the loop. You can do that with wp_get_post_terms. Take note that this is where the $post_type variable comes into play. Lastly you just need a simple if-else statement to check what type of display to use, echo or return. The below states: If $display is equal to false, then echo it, if it’s equal to return, the return it. Another way to do this is to just check for the “return” keyword and, if it’s false, echo the term with an else. However, I prefer this way as it more clearly states what’s going on. It works, but how to HREF link to the Term archive? You’ll need to use the get_term_link() function. More info here: https://developer.wordpress.org/reference/functions/get_term_link/. This is awesome! Just a quick question, is there anyway to make the output links? Thank you! Thank you! In fact i was trying to filter WP_query by a term but it was impossible with ‘terms’ => get_queried_object()->term_id., I don’t know why. I could with your function. thank you!! You are awesome, thanks for this code. Very useful.